About a month ago, I was surfing the ‘net, looking for cool Dutch oven sites and I revisited cooking-outdoors.com. 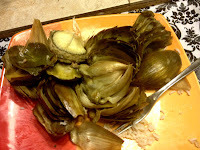 I found this recipe: http://www.cooking-outdoors.com/dutch-oven-stuffed-artichokes-recipe.html for stuffed artichokes. Instantly, my thoughts and memories went back to my childhood, when my mother steamed some artichoke heads and served them for dinner. We were quite used to strange and new things appearing on our plates, and most of it was good so we tried it. Dad showed us how to pull out the leaves, dip them in the butter sauce, and scrape the tasty, pasty meat off the leaf with our teeth. I can still remember that as one of our many fun dinners. It was so different, it became not just a good meal, that was good for us, it became an event the family would remember for many years to come. At least, I would! And as soon as I saw this and watched his video, I knew I had to try it. ...And, of course, I can’t just follow the recipe. I have to try things a little differently! Some of the things I did today were improvised on the moment. I’ll try to recreate them as a recipe, but remember that the amounts are only guesses at best. When you cook them, I encourage you to improvise as well. After all, cooking is like a good jazz tune, right? The first thing I did was to get my 12” regular Dutch oven heating on a lot of coals, with about a tablespoon or two of olive oil in it. It was a very breezy March day, so I knew I was going to go through a lot of coals, and I would have to watch it close and manage the heat very carefully. Once the oil was shimmery, I dropped in the aromatic veggies. They simmered right away, and I cooked them until they started coloring brown a bit. Then I put in the sausage. When browning the sausage, I took great pains to work the meat so that it ended up cooking in very fine, small chunks. Big globs would be difficult to stuff into the leaves. At this point, I also added in the herbs and seasonings. It will look like you’re making too much filling to put in the artichokes. That’s OK. Not only do they hold more that you think, but you’ll use the remainder later. When the sausage was done, I pulled it out with a big serving spoon, working to get out as much as I could. Then I poured in the water. I refreshed the coals, and put the lid on, setting it to boil while I worked on the artichokes. The first task was to finish the stuffing. I stirred in the bread crumbs. If you use, by the way, pre-seasoned italian bread crumbs, I wouldn’t worry about adding in all the herbs. I stirred it all up, and it mixed pretty nicely. The crumbs absorbed the sausage grease very well. If it still looks too dry and unmanageable to you, you can add a bit of olive oil. I didn’t. It clumped, but was also a bit loose. Using my kitchen shears, I snipped off a row of the bottom-most leaves, and any leaf that was out on the stem. Then, I trimmed off about 1/4 inch off of every leaf in the head, just going around the perimeter. This looked nice, as Gary said, but it also made a big difference in the stuffing. Once I got to the central part, I used my chef’s knife to lop off the top half to 3/4 inch of the center. Then I used my thumb to pry the whole thing open, and to loosen and stretch the leaves. Finally, I cut off the stems. Then, I stuffed the artichokes. I held them over a plate to catch all the leftover stuffing. I held it upright in front of me with one hand, and used that thumb to pry apart the leaves. I poured stuffing into the spaces with a spoon. I was surprised how much I could get into one head. Even still, there was about a third left over. Back out to the Dutch Oven, where the water was boiling by now. I put each artichoke head into the Dutch oven, stem down, side by side. All four fit pretty snugly. I put on the lid and marked the time. From that time on, it was only a matter of maintaining the coals on the bottom and checking at 20-30 minute intervals if the water was still there. I let these cook for about an hour and 15 minutes. While they were cooking, I first made the sauce, and then made the rice. Like I said, the quantities of the ingredients of the sauce were pretty much improvised. I put in the mayo, then the salsa. I whisked those together and tasted to make sure there was a balance. Then, I added the other ingredients and seasonings by shake. At each point, I tasted, until I felt there was a good balance. I did add the chili powder, but I didn’t want this to be a hot dish. I just wanted some ZING. When there was only 20 minutes or so left in the cooking, I put on the rice, water, and stock. I noted when it started boiling by when it vented out from under the lid. From there I let it cook on the coals for about another ten minutes. Then I took it off the coals and let it sit, covered, for another ten minutes. Finally, I fluffed it with my fork, and mixed in the remnant of the filling. That was another thing that was improvised. 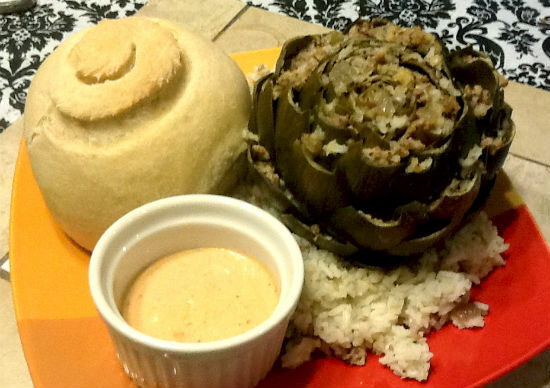 I served it up with a bed of rice, and the flowery head of the artichoke on top. Off to the side was a small ramekin with the dipping sauce. I also had made some small loaves of sourdough today, so I included that in the picture. If you’ve never eaten whole artichoke before, it really is a lot of fun. It’s finger food. You grab one of the leaves by the tip, and pull it off the head. It kinda acts as a spoon and catches the stuffing that was in that pocket. You dip the foot end into your sauce, then put it in your mouth. You scrape the leaf against your upper teeth, scraping all of that soft stuffing and artichokey goodness off the leaf husk. Then you set the leaf on your plate, and grab another. It was a really delicious meal. One of my sons fought us on the leaves, but he loved the rice. The other loved the whole thing. It was a family evening together that I’ll treasure for a long time! This Dutch oven recipe is included in my Dutch oven cookbook, "Dutch Oven Breads"
Last week, I was working on my final book, “Dutch Oven Breads”, and I got to the chapter on “Getting Creative”. After all of my instructing and pontificating on bread making, I finally offered some suggestions on making your own bread recipes. It turns out that almost all bread is the same at it’s core, and that you take the same basic ingredients, you can simply add a variety of enrichments to create an entirely new loaf! Then you can name it and call it your own. So, to test that theory, I took a core recipe and made two completely different variations. From the same base, each finished loaf was a unique texture and taste. To read about all of my ideas and suggestions for enrichments, you’ll have to get the book! More oil, basil, and oregano for the topping. The first thing I did, about an hour before making this recipe, was to mix the oil and the herbs in a small bowl. Actually, I used a ramekin. It was the right size, and it was handy. I let it sit so that it would release the flavors of the herbs into the oil. Then, a while later, I mixed the yeast, water, and sugar, and let that set for a while to get all frothy and yeasty. While that was proofing, I prepared the other ingredients. I sifted in the flour, added the salt. Finaly, I added all of the ingredients together, the oil/herb mixture, the yeast mixture, the dry ingredients, the tomato paste and the egg, and stirred it up. I turned it out onto the floured board and started kneading. Right away, I could tell that the texture would be different. It was much more moist than I thought it would be. I didn't anticipage the extra liquid from the tomato paste. But, as I kneaded and added more flour, it turned into a nice dough ball. After a while, it gave me a good windowpane, and I set it aside to rise. It actually rose up very nicely, and I let it go a bit bigger than I usually do. When I decidd it was done, it had a rich smell, just like a great tomato sauce. Finally, I punched it down and re-rolled it into a boule. I sprinkled about a teaspoon of additional basic and oregano onto a plate and spread it around. 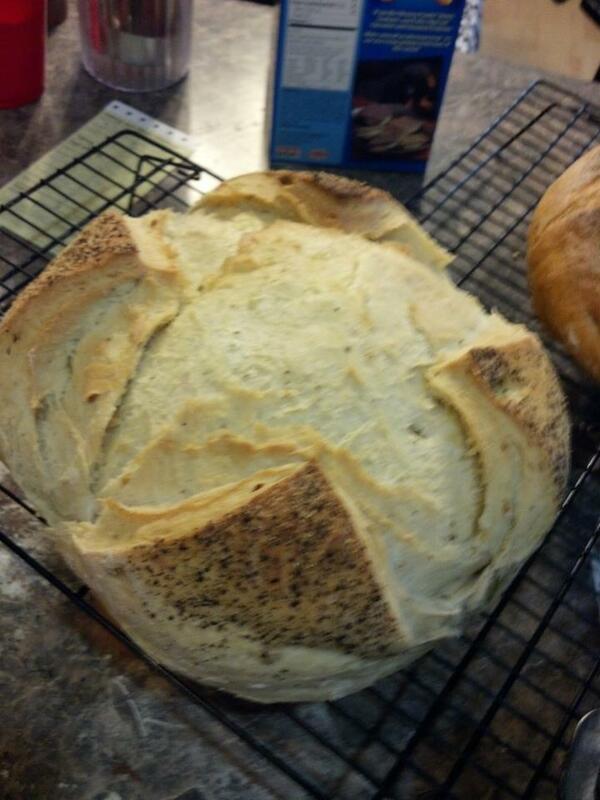 Then, I brushed the top of my new boule with olive oil. Finally, I turned it over onto the herbs and pressed the dough onto the plate. When I rolled it off, there was a nice coating of shredded herbs stuck to the ball. I put it, bottom-down, into a well-oiled bowl, and let it sit to proof. Right away after that, I went outside and lit up some coals. When those were nicely white, I placed an oiled 12" Dutch oven on and under the coals as enumerated above. I let that sit to pre-heat for about another 15 minutes. When the bread had fully proofed, and the Dutch oven was hot, I took the bowl with the boule out to the oven. I lifted up the lid, and then, with my hands, carefully lifted the doughball out of the bowl and into the oven, herb-side-up. I sliced it with an "X", and closed up the lid. About 15 to 20 minutes later, I turned the Dutch oven, and lifted the lid just quick enough to insert the thermometer. I was hit with this wafted wave of delicious tomato smell. It was amazing! I knew this one was going to be good. After another 20 minutes or so, I checked and it was done. The thermometer read about 200. I brought it in, and turned it out onto a cooling rack. The smell was wonderful. Later that evening, as we tasted it with marinara pasta and meatballs, the meal was complete! 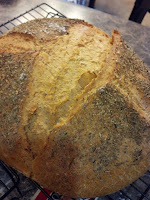 Here's another bread I did, actually, on the same day, and at the same time as the Tomato Bread. This was inspired by my good friend Omar Alvarez. He's an amazing Dutch oven chef in his own right, having won the World Championship Cookoff a few years ago. He emailed me his recipe after posting pictures on his facebook page, and I really wanted to try it. I saw that it was really close to my core recipe! So, I just adapted it! The process is essentially the same as the recipe above. I baked them that day side-by-side! Start by letting the oil steep the garlic and the black pepper (what an aroma THAT is!). Then, proof the yeast, and mix in the other ingredients all together. Knead it until it stretches into the windowpane, then let it rise. In this case, I also coated the top of the loaf with more ground black pepper, just like I did the herbs in the tomato bread. The coals were heated as the bread proofed, and the loaves baked side-by-side. I actually liked the subtleties of the garlic even more than the tomato. But they were both delicious and so unique and different. 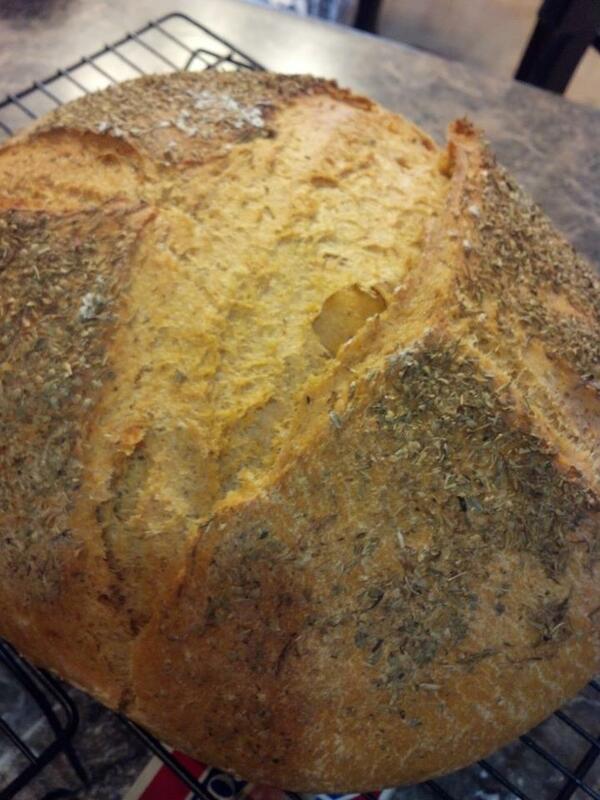 The whole experience just showed how easy it is to make a loaf of bread that's brand new! Here's another great, but strange, example of Dutch Oven Cooking, with Dandelions, and more about what to cook in a dutch oven.